A Princess costume set. 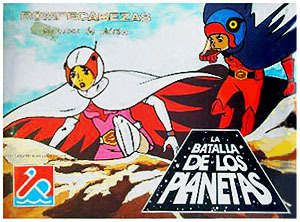 Although they featured the same bird head chest logo as the French children's costumes, the rest of the Spanish versions featured their own original patterns and styling. The Princess costume came complete with a body suit, a cape that could snap on to its back, a flexible plastic helmet with see-through visor, an adjustable belt with "G" buckle/logo and white shoe covers that went roughly to knee length. The costumes came in three different sizes and were available in Mark, Princess and Keyop versions. 1979, by Josman. 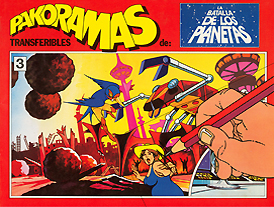 A puzzle set from Spain. 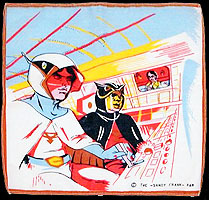 It featured original art printed on each of six sides of plastic cubes. Year unknown, by Dalmau Carles. 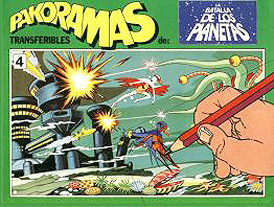 A puzzle set from Spain. 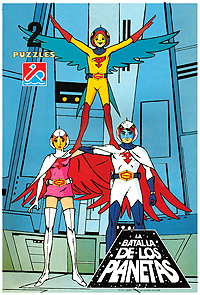 It included two different puzzles with art based on frame grabs of episodes, The set also included matching posters of the two puzzle images. Year unknown, by Dalmau Carles. 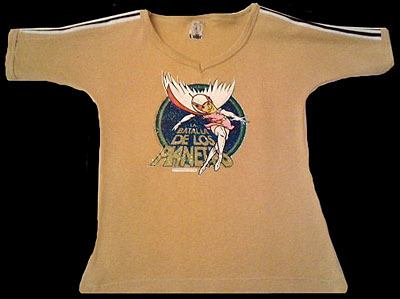 A Spanish children's shirt. 1979, by Collie. 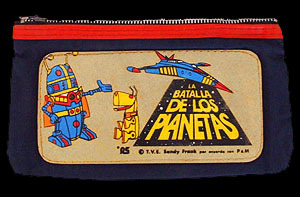 A pair of Spanish canvas banners. They are approximately two feet tall. 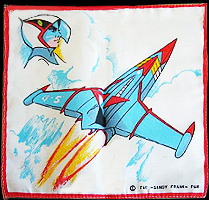 Year and manufacturer unknown. A pencil/school supplies zippered pouch. 1980, by Roise, S. A. 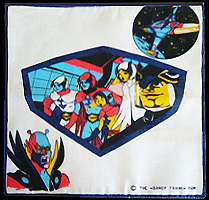 Four children's handkerchiefs, each is about 8 inches square. Approximately 1980, manufacturer unknown. 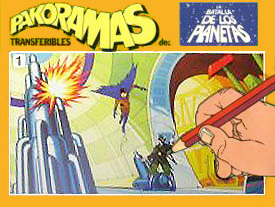 All four Spanish rub-down transfer set designs. 1980, by Letraset Spain. Two small punch-out flying discs. 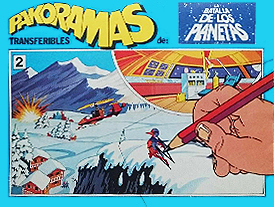 They were made available through issues of "Bomba" magazine. 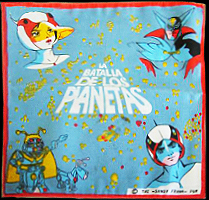 1980, by Bomba. 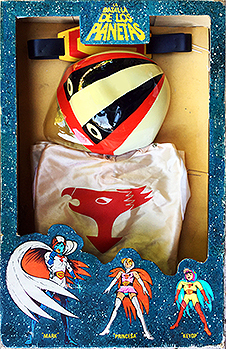 A light, hollow plastic, 8" tall 7-Zark-7 candy package. Approximately 1980, manufacturer unknown. Two small Spanish buttons featuring Mark and Keyop. 1980, manufacturer unknown. Four metal keychains from Spain. Each had one or two colors of paint. 7-zark-7 had articulated arms and 1-Rover-1 had articulated legs and antennae. 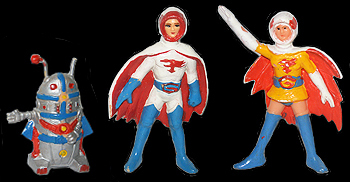 1980, Sebastian S.A.
Three small, solid plastic figurines of 7-Zark-7, Mark and Princess. 7-Zark-7 is missing part of one antenna. 1980, manufacturer unknown. 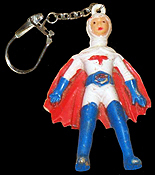 A solid plastic Mark keychain. 1980, manufacturer unknown. 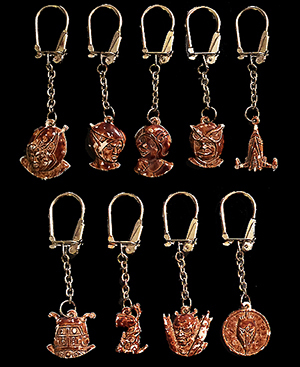 An incomplete set of small, plastic keychains. They were given a light paint application on their front sides to make them appear metallic. Princess and Zoltar examples were also known to exist. Approximately 1980, manufacturer unknown.